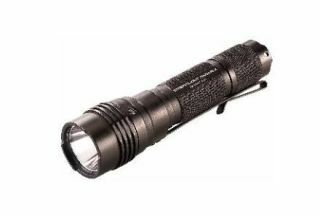 A 1000 lumen tactical light will run on two CR123A batteries or one 18650 Streamlight rechargeable Li ion cell for power flexibility. Features a tail cap Ten-Tap programmable switch. Includes pocket clip, CR123A batteries and holster. 1000 lumens 1hr15min, 400 lumens 3hrs., 65 lumens 20 hrs. on CR123A batteries. 5.43"x1.44"x1", black.